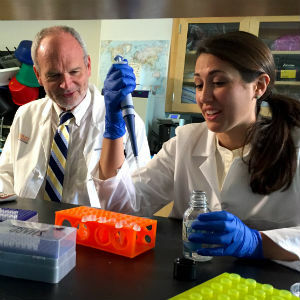 Bill Petri, MD, PhD, and Erica L. Buonomo, PhD, collaborate at UVA. Researchers at the University of Virginia School of Medicine have identified immune cells vital for protecting us from potentially fatal C. difficile infection. Surprisingly, those cells are often vilified for their role in causing asthma and allergies. But when it comes to C. difficile, they could be the difference between life and death. With the discovery, the researchers have answered some of the greatest questions about C. diff, shed light on why antibiotics lead to severe C. diff andidentified a potential way for doctors to prevent the life-threatening infection – and possibly other infections as well. There were almost half a million C. diff infections in the United States in 2011, and more than 29,000 patients died within 30 days of infection, according to a study released last year by the U.S. Centers for Disease Control and Prevention. The agency has classified the bacterium as an “urgent threat,” noting the rise of a new epidemic strain in recent years that has made the infection even deadlier. C. difficile is primarily a hospital-acquired infection, and it predominantly affects the elderly, particularly elderly people on antibiotics. UVA’s discovery offers answers about why that is. The researchers showed that the gut bacteria stimulates the production of a protein called IL-25, which then recruits protective cells called eosinophils. As such, IL-25, the product of “good” bacteria, protects the lining of the gut from pathogens. Antibiotics, however, disrupt our body’s natural bacterial populations, leaving the gut lining vulnerable to C. diff and other infections. Intriguingly, the researchers found an important and unexpected role for eosinophils, a type of white blood cells. These cells are often vilified for their role in causing both allergies andasthma, but in the battle against C. diff, they can be life-saving. IL-25, the UVA researchers show, protects us from C. diff by manufacturing eosinophils to guard the integrity of the gut lining.The epidemic strain of C. diff is so deadly specifically because it kills eosinophils, allowing it to breach the gut, the researchers determined. The findings suggest that researchers should be able to develop new probiotics that patients could take to ward off C. difficile. “We could end up that every person taking an antibiotic is taking a new probiotic that is specifically designed to maintain IL-25 and eosinophils,” Petri said. The discovery has been described in a paper published online by the scientific journal Cell Reports. It was authored by Buonomo, Carrie A. Cowardin, Madeline G. Wilson, Mahmoud M. Saleh, Patcharin Pramoonjago and Petri.